In a world where more new couples are meeting online than in person and friendship is measured by requests, follows, and likes, it might seem like relationships forming and developing through the internet is the norm. According to the Pew Internet and American Life Project, 59% of internet users feel that online dating is a good way to meet people, but that number might go down as the prevalence of catfishing continues to grow. Deceptive internet frauds called catfishers target individuals with a range of goals, from revenge and cyberbullying to building false relationships and even theft or crime. The term catfish was reserved for the barbed freshwater. That is until 2010, when filmmaker Nev Schulman chronicled his experience meeting and falling in love with a woman he met online, "Megan". In the end, the documentary revealed that the woman behind Megan was in reality a woman named Angela, using a fake name and photos of a Vancouver based model to create the online profile. The documentary was titled "Catfish" based on a story Angela's husband shared. They used to tank cod from Alaska all the way to China. They’d keep them in vats in the ship. By the time the codfish reached China, the flesh was mush and tasteless. So this guy came up with the idea that if you put these cods in these big vats, put some catfish in with them and the catfish will keep the cod agile. And there are those people who are catfish in life. And they keep you on your toes. They keep you guessing, they keep you thinking, they keep you fresh. And I thank god for the catfish because we would be droll, boring and dull if we didn't have somebody nipping at our fin. Vince Pierce in Nev Schulman's 2010 documentary "Catfish"
"Catfish" the movie led to an MTV spinoff that launched in 2012, and the term catfish is now widely used to describe "a person who sets up a false personal profile on a social networking site for fraudulent or deceptive purposes." But catfishing isn't limited to social media sites like Facebook, Twitter, and Instagram. Fake profiles are commonly found on dating sites as well. In Catfish the TV show Nev helps individuals who aren't sure whether the people they met online are who they say they are while conducting amateur investigations, usually consisting of reverse image searches and reaching out the individual's friends and family on Facebook. But a true catfish or social media investigation is more intense than that, and so can are some of the after effects. Catfishers get close to their targets for a variety of reasons, some as severe as fraud, blackmail, and identity theft. What are some of the risks of being catfished? This is why it's important to educate yourself and your family about the dangers of being catfished, and to know how to move forward if you suspect something is not right with someone you are getting close to online. What are some of the signs you might be being catfished? If something seems off and you are concerned about a new online friend, or are noticing some inconsistencies with someone you've been interacting with for a while, there's a chance you are being catfished. 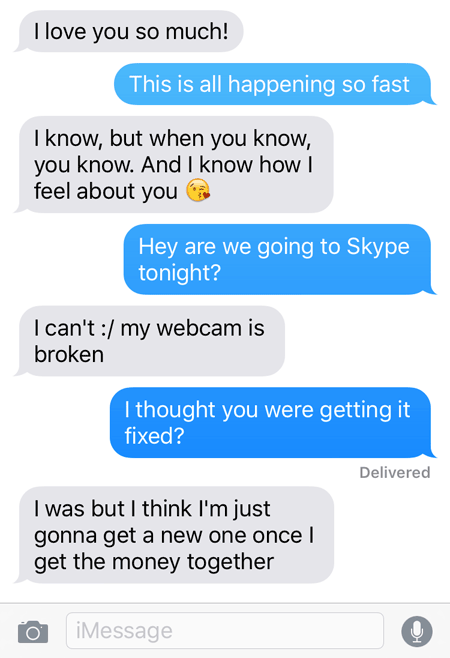 They refuse to video chat or keep having problems with Skype, FaceTime, etc. What to do if you think you are being catfished? If you want definitive answers, you could apply to be on Catfish: The T.V. Show. However, there's a good chance you won't be selected, and not everyone wants to face potential heartache and embarrassment in front of a national audience. You can run a "DIY catfish investigation" using some basic methods like reverse Google image search and searching for other profiles or taking a close look at the person's friends, but often times this information can just add to the confusion and raise more questions. It also takes a lot of time. While it can still show you the person may not have been honest with you, it's not common to get definitive answers through these methods, and when it comes to an online relationship with feelings of doubt, most people want clear-cut answers either way. So, if you need help finding answers, hiring a social media investigator might be the way to go. A social media investigator will be able to run searches across multiple platforms, set up alerts for posts containing certain information and new accounts being created, and be able to look at the geographic and time stamp data of posts and uploads. For supplemental research offline, a private investigator will also have access to databases through which they can verify the individual's personal data. Getting answers is an important part of getting closure and moving forward. A private investigator can conduct an extensive social media investigation to get you answers, and to determine once and for all whether or not the person you're speaking with is who they say they are. To find a local private investigator for a catfishing investigation, use the search tool at the top of this page or call us toll free at (888) 997-4669.